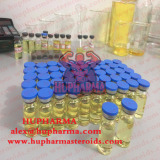 Boldenone undecylenate is an anabolic steroid with weak androgenic activity level and sufficiently moderate anabolic effect. Boldabolic penetrates into the cell nucleus and activates the genetic apparatus of the cell, resulting in increased synthesis of DNA, RNA and structural proteins, enzyme activation circuit tissue respiration and increased cell respiration, the oxidative phosphorylation, ATP synthesis and accumulation macroergs intracellularly. Leads to increased muscle mass, decreased fat deposition, improving trophism and tissue promotes the deposition of calcium in the bones, the body retains nitrogen, phosphorus, sulfur, potassium, sodium and water. Hematopoietic effects associated with increased synthesis of erythropoietin is mor pronounced than in testosterone.